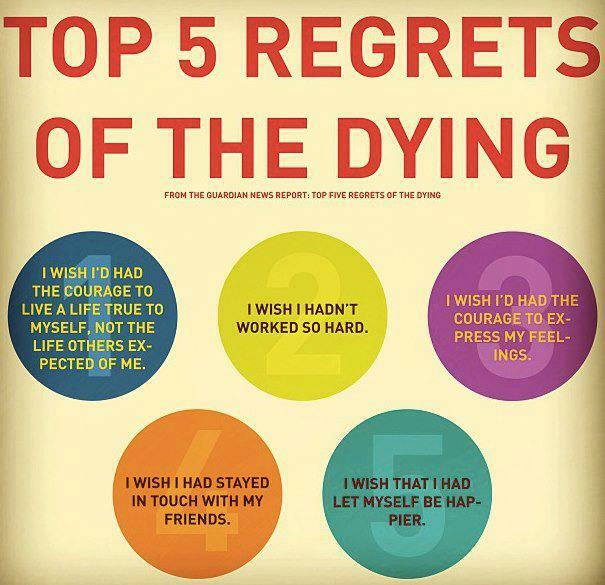 The last thing that most people want is to make it to the end of their lives and realize that they’d done it all wrong. It’s definitely worth taking a minute to picture an older version of yourself and evaluate your life from that perspective. It’s difficult, however, to know for sure though what you really value until death is actually looking you in the face. Almost everyone has a long list of dreams when they are young. However, maybe because you’re told that you can’t do it or because you’re told you’re supposed to do something else… you get led astray. Think back about what you dreamed of becoming (or just ask yourself what you want to be now). You don’t have to do anything drastic like quitting your investment banking job to become a painter. But, at least pick up paining as a hobby and, who knows, maybe you’ll get good enough that it will become a full-time job before long. Working hard is important. You need to work hard to realize your dreams and gain financial security. But don’t forget that there’s a lot more to life other than just work. And, as it turns out most dying people realize that work wasn’t as important to them as say, their family. So, is that $1,000 raise really more important than your kid’s soccer game? Probably not. Is there a girl you have feelings for, but you don’t say anything because you’re afraid you might get rejected? As it turns out you aren’t very likely to regret taking a chance and failing, but you are likely to regret never trying. It’s easy to lose touch with friends especially as you move to new cities and start families. However, it’s easy to get back in touch with friends with sites like Facebook. Make a point to stay in touch with your friends as regularly as you can. You have no legitimate excuse not to. Many people come to believe that money, power, success is the most important thing in life. Many believe that they’ll be happy when they get that next promotion… but it’s never enough. Prioritize happiness and do things you like doing. You won’t regret it. Can Low-Carb Diets Reduce Inflammation?